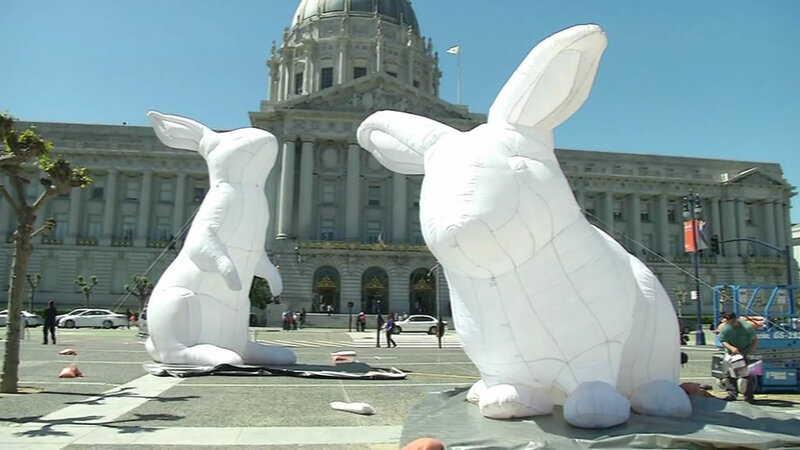 SAN FRANCISCO (KGO) -- Workers installed 23-foot-tall rabbits at San Francisco's Civic Center Plaza on Monday. The five rabbits will be on display through April 24 and be lit up at night. They are inflatable sculptures designed to raise awareness about Australia's rabbits, introduced by early settlers, that are now an out-of-control pest. We think they've learned from the Super Bowl 50 sign vandalism They want you to know the bunnies are waterproof and fireproof and that a guard will watch them 24 hours a day.